There is nothing wrong to state that we are all surrounded by numerous on-demand apps and the laundry apps is leading the way forward. It has rather become a necessity considering the busy schedule of life. Do you remember the older days when the washer-men visited home every week to collect the dirty clothes? He would wash and then iron the clothes before delivering it again. However, this practice faded out and was replaced by the washing machines. As such people don’t want to invest their valuable time in day-to-day household chores such as washing the clothes as they have other important assignments to attend to. Moreover, it is often regarded as a very hectic and tedious job that can consume a lot of time. So, the on-demand laundry app has come to their rescue. 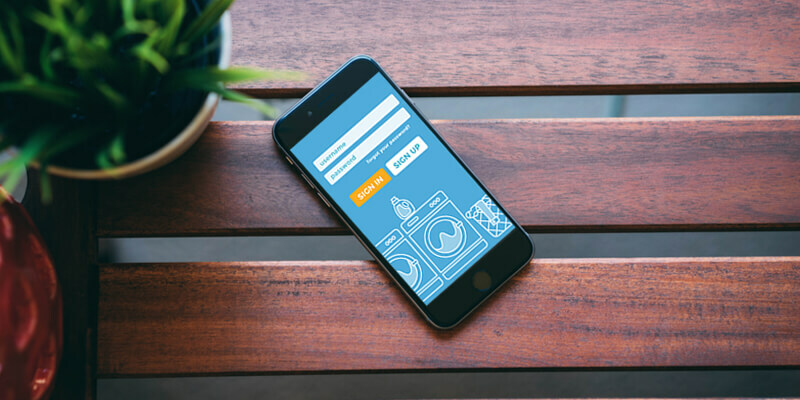 Ever since the introduction of the on-demand laundry app, it has proved be a huge bonus for the customers. The demand for laundry services worldwide is augmenting and if you are into this business then the future prospect seems to be quite illuminating. Thus, it is high time to avail a dry-cleaning and laundry mobile application to reach out more customers. According to the statistics, the revenue of the laundry services in 2016 was about 7.98 million US dollars, which is expected to go up to 8.90 million US dollars by 2020. The presence of dry-clean and laundry app provides you a much wider scope of targeting the audiences. Having said that you can not only search for individual customers such as working professionals and students, but you can even pitch for specific places such as hospitals and hotels which have clothes in bulk including the bed sheets, towels, curtains, uniforms and so on. The user needs to just login into his account and fix a schedule i.e. date and time for picking up the clothes. Assemble all your clothing at one place. The pickup person would visit your home and collect all the outfits and other items that needs to be washed. The clothes are taken to the laundry center where they are cleaned properly, ironed and folded before getting ready to be dispatched. The clothes are wrapped in paper sheets and then delivered back to the owner. Before you can get through the key features of the laundry app, it is recommended to have a brief understanding of the major components of the app. The client page is the portal through which the customer can get in touch with the laundry services. Firstly, the app developer needs to develop a registration or login page where the client can login using his name, email and mobile number. The developer also has to provide the facility of geo-location so that he can search for the nearest laundry center within the quickest of time. Next you have to provide your customers with various options to choose the service he wants to avail. You can include options like washing, ironing, dry-cleaning etc. Also do include the price for each of the services so that the customer can make the choice according to his budget. 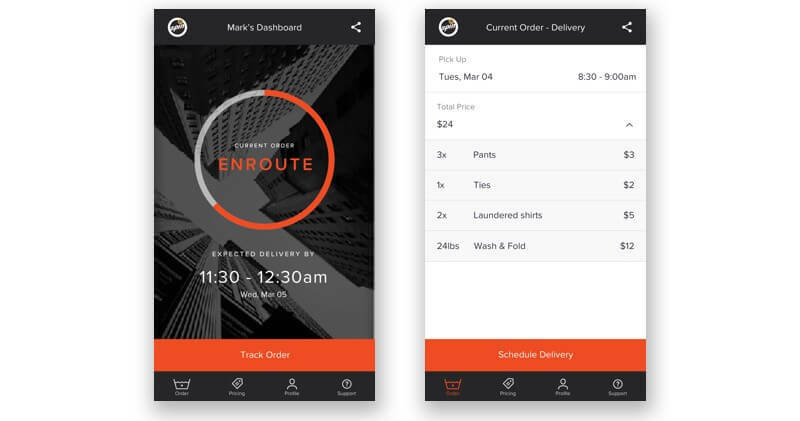 The next important step is including the in-built app calendar, which will allow the client to select the pickup and the delivery date and then book the appointment for the pickup man to collect the clothes. The app also provides them fresh status keeping the customer updated about when it is being washed and the time out for delivery. In the next part, the app developer has to focus on building the laundry or the staff page, which is usually managed by the owner. Like the client page, it also a login portal where the owner has to feed his information before he can begin managing the orders. The owner will get the info about the total numbers of orders booked, the pickup and the delivery time, get the exact location of the customer to send for collecting clothes, their numbers, type of service booked, management of offers and discounts and so on. The Admin Panel is the main server that controls both the client as well as the staff page. Its main function is properly handling the database management and other issues related to the app. It also keeps the history of all the booked orders and has control over the dashboard. In short, it is the main apex body of the app. As it has been discussed before that the login page is vital aspect for both the client as well as the staff panel. Therefore, your laundry app must have a registration portal. It should be simple and should only ask the user to fill in general info such as email id, phone number and if not more than residential address. Most of the on-demand apps are GPS enabled and so the laundry services are no exception to it. With the help of the GPS technology both the customer and the owner will be able to track the status of order. The customer can keep an eye on what is being done to his clothes and when it is going to be delivered. On the other hand, the owner will keep the track of the pickup delivery and also know what orders are lined up. Usually people book date and time slots as per their convenience such as every week or a fortnight. So, if they set the automatic time reminder in their app, they would remember to give their clothes for washing and won’t forget even if they are too busy with their tasks. The clothes would get picked up and rightly delivered when they need it. It is important to clearly mention each of the services that you are offering to the end users. For instance, if it is washing then what are different kinds of washing, ironing, folding etc.? Also there are different charges for different sizes of clothes, the cost can also differ depending on fabric. For instance, woolen outfits need soft detergent. If in case there is a particular stain that needs to be removed, then you may have to pay extra. You can give more information about your laundry, which would also act as a source of business promotion. You can assure your clients that you are using eco-friendly services and making use of detergents that won’t harm their clothes at all; and their clothing will be treated with great tender and care. It will be washed appropriately. You can also provide the customers with the option of scented and unscented washing. Well, this is one of the common features that perhaps you would come across in most of the on-demand apps. This is the technique to attract new customers and also keep the regular customers for longer period of time. Although it is evident that you will win the trust of the clients through your exceptional services, but the offers and discounts will keep the customers interested. You can offer free washing for a specific number of clothes or offer free ironing. 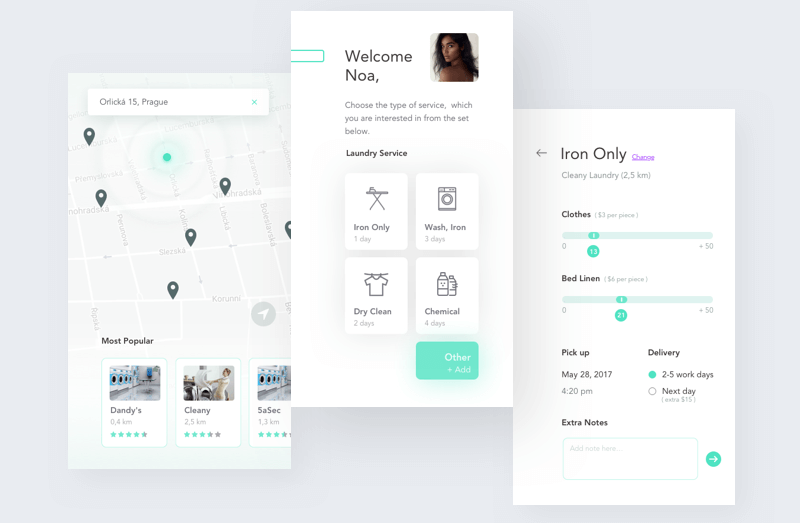 When you are developing an on-demand laundry app, your final target is making the services convenient for the customers. So, this practice must be followed when you are incorporating the payment methods. It is up to you whether you want to offer the Cash on Delivery option or will only implement the online payment mode. This is often regarded as the most interesting part of the discussion because ultimately everyone who is willing to start a laundry business or is already into it, will be willing to know the cost estimation of developing a laundry app. The cost depends on the number of hours taken to develop the app as this is the general estimation taken by the app development companies. The major factors include design of the app, selection of the platform (Android or iOS,) front-end and backend development and finally the app testing. For designing the app in both cases i.e. Android and iOS, the developers usually take about 150 to 200 hours. The development of the app on the Android platform takes less time; near about 700 hours in comparison to iOS where it takes about 750 hours. The backend development will take approximately around 200 hours and another 60 hours is dedicated for designing the Admin Panel. And it has been told that the development cost differs from country to country. So, roughly, the estimate would come across to $10,000 to $30,000. With people running short of time to commit to their daily tasks, they are getting more dependent on the on-demand apps. The laundry app is one of those applications that has taken a big giant step forward and because of the easiness and convenience offered, more and more customers are getting attached to it. Therefore, if you are looking to develop a laundry app and give your business a flier, then feel free to get free quotation from the expert app developers.